Explanation: Small asteroid 2008 TC3 fell to Earth at dawn on October 7, 2008, tracking through the skies over the Nubian Desert in northern Sudan. That event was remarkable because it was the first time an asteroid was detected in space before crashing into planet Earth's atmosphere. It was generally assumed the asteroid itself had completely disintegrated to dust. But, based on satellite and ground observations of the atmospheric impact event, Dr. Mauwia Shaddad of the University of Khartoum, aided by Dr. Peter Jenniskens of the SETI Institute and NASA Ames Research Center, led an expedition of students and staff to the area, combing the desert for surviving fragments. On December 6, 2008, two hours after their search began, the first meteorite was found. 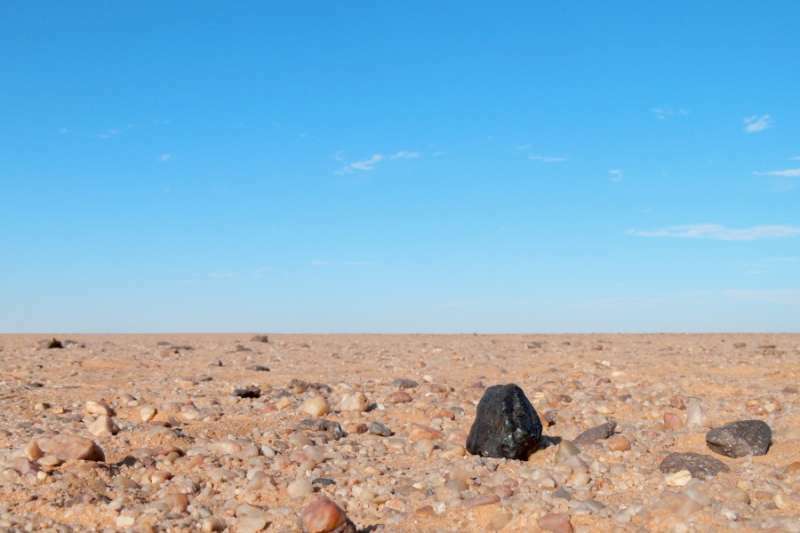 The team ultimately collected some 280 small meteorites, now called Almahata Sitta, with a total mass of about 5 kilograms -- the first material recovered from a known asteroid. In stark contrast to the lighter-colored stones, the black fragment in the picture is Almahata Sitta meteorite number 15. About 4 centimeters in diameter, it is seen as it came to rest on the desert floor. Editor's note: In Arabic, Almahata Sitta is "Station Six": a railway stop in the Nubian desert where witnesses reported seeing the bright fireball meteor.